The W.A. Baum Company Roll-By Mobile Aneroid Sphygmomanometer is Perfectly suited for the hospital, clinic or nursing home environment. We carry the entire line of W.A. Baum products. Baumanometer® has been the world standard since 1916 for blood pressure measurement by a simple principle: devotion to uncompromising quality. The Roll-By™ is a 300 mmHg Aneroid instrument for mobile use. V-Lok® inflation systems, 8 feet of Extendex® tubing, large integral storage basket, and die-cast aluminum wheel base and cast iron weight for increased stability. It's built to agree with our master instruments, which are traceable to the United States National Institute of Standards and Technology. It complies with ANSI/AAMI SP-9 for accuracy and performance (1% full scale ± 3 mmHg). The unique, low reflection, high contrast scale and red pointer increase visibility and reduce parallax error. They are manufactured with a precision low friction movement and twin pre-seasoned phosphor bronze diaphragm capsules. 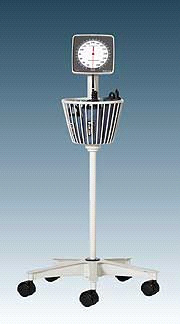 The manometer housing is neutral white ABS plastic and is mounted at a 20° angle for ease of viewing. The Baum Roll-By™ is 39 inches tall. Its packed weight is 16 1/2 lbs. The contoured handle and five point wheel base (20" dia.) are die-cast aluminum. Wheels are 2" (50 mm) hooded casters with mar-resistant polyurethane treads. The support pole and instrument mounting tube are heavy gauge, machined aluminum tubing. The large storage basket is nylon coated steel and aluminum. All metal parts are finished with neutral white baked enamel. The standard Adult Calibrated® V-Lok® Cuff is medium blue Dacron™ polyester.